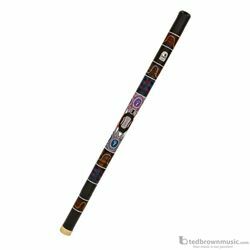 The Toca bamboo turtle didgeridoo is hand painted and is 47" in length and has a booming, authentic voice that can only be achieved with bamboo. The didgeridoo is a wind instrument developed by Indigenous Australians of northern Australia around 1,500 years ago and still in widespread use today both in Australia and around the world. It is sometimes described as a natural wooden trumpet or "drone pipe". The didgeridoo has shown that those who use the instrument have health benefits as well, according to the British Medical Journal.